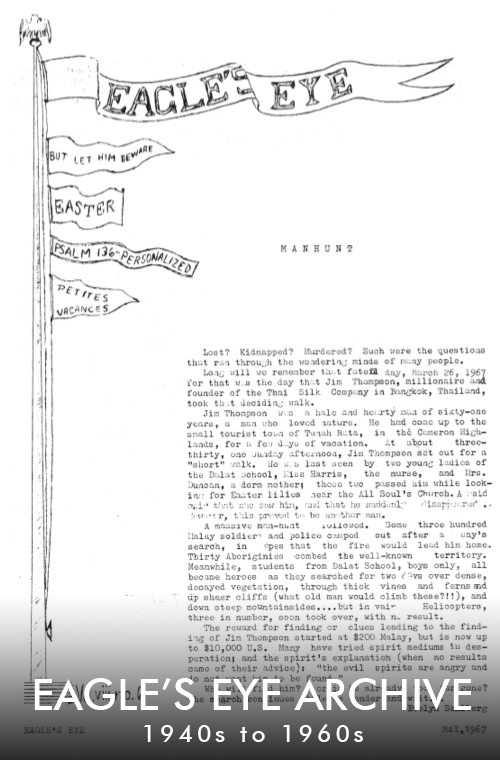 The first issue published at Dalat was on August 1949, underneath the name Pine Echoes. By 1958, the name of the publication changed to Pine Hill Echoes. In 1962, the issue was titled Bamboo Beacon. 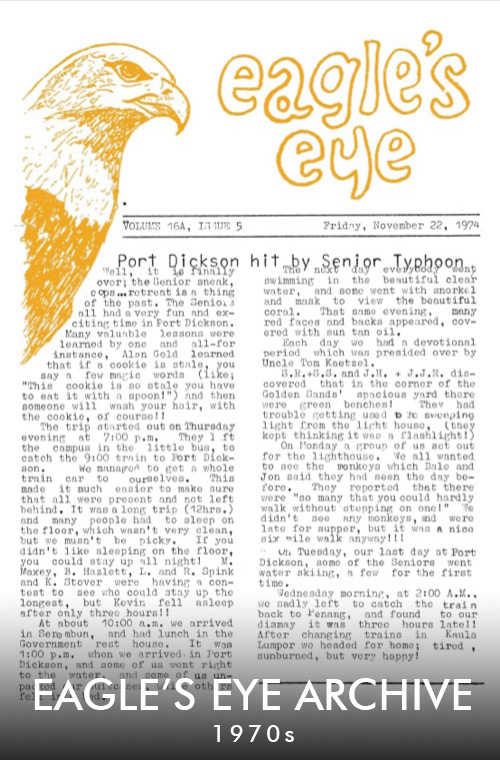 The first issue of Eagle’s Eye was from 14 October 1964. Regardless of the name, the purpose of each issue was two-fold: 1) to let kids showcase their work to parents and alumni, and 2) to inform parents of what was going on at Dalat. The latter was especially important when 100 percent of the student body boarded, and communication between parents and kids was limited to a weekly airmail letter. Obviously, as this means was often inadequate to let parents know what was going on at school, the paper was sent out. John “Tommy” Tompkins served as collector/facilitator/formatter from 1978-2015. 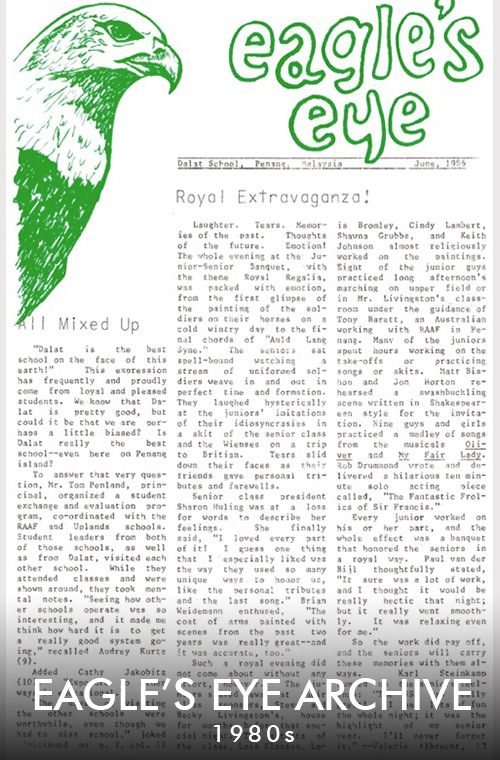 Copies were produced quarterly for parents and alumni; eventually, these publications went from print to online. Mr. Tompkins’s favorite aspect of publishing these updates was to receive letters of appreciation from alumni and parents. 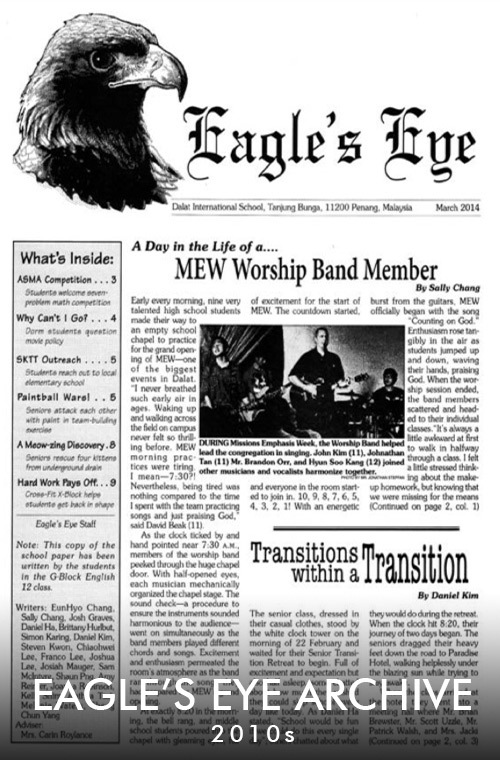 The most common article type in Eagle’s Eye was feature writing. Occasionally, one of the students would write an editorial giving an opinion on a topic or a poem. There was also a “Dear Abby”-style column called “Dear Gertrude.” Lastly, there were point/counterpoint columns where kids wrote on two sides of an issue. Archives of these issues can be found below. Currently, seniors write journalistic articles about Dalat events on The Senior Scribble. 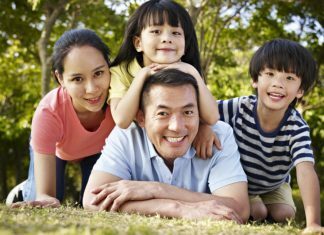 The Senior Scribble is a blog whose link is published in the Dalat News on a weekly basis. Seniors report on any area of current school life. 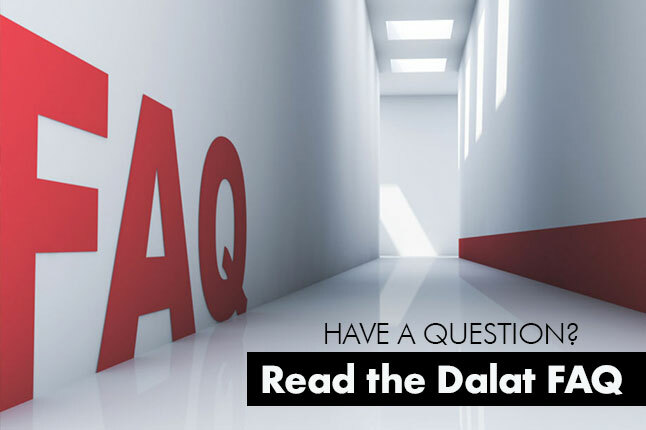 The topics should interest a broad audience—the whole Dalat community—which includes ES, MS, and students, families, and staff. Each senior writes one article during both the fall and spring semester. This year’s pieces highlighted the following artistic expressions: poetry, creative fiction, essaying, news article, photography, painting, drawing, film, dance, musical score. Be filled with joy from their artwork. If you want to see previous issues they are available via Issuu or via our Download Center. Archive issues are available via decade lots as per the following. 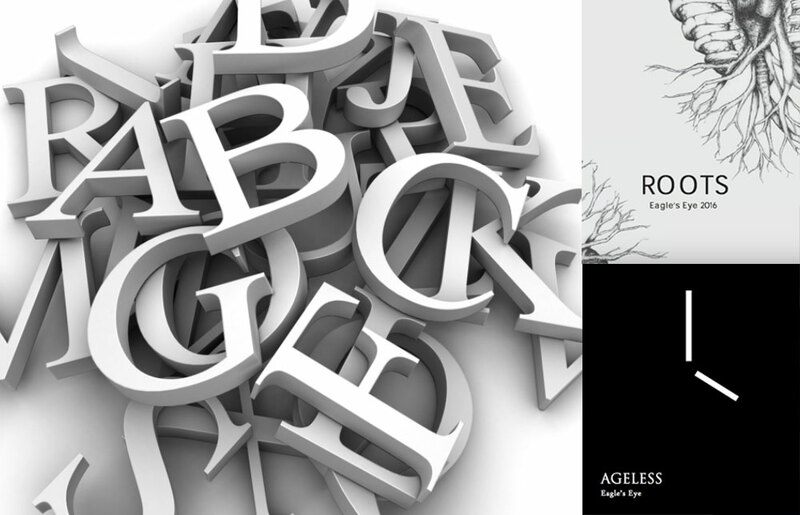 Click to download the PDF files in batches.